At the Hannover Computer Faire (“Hannover Messe”) in West Germany, Commodore shows a variety of new, higher-end PET models and peripherals, including the 2040 dual disk drive. The long-awaited disk drive is faster, larger and more sophisticated than the comparable product from Apple, but costs more than twice as much ($1295 vs $495) and is a year late to market. At the same show, Atari introduces their Atari 400 and 800 computers, and TI debuts the TI 99/4 personal computer. Science of Cambridge (headed by English inventor and entrepreneur Clive Sinclair) introduces the Sinclair ZX80, priced at £99. It is an immediate success, with eventual sales of about 50000 units. CSG has their BASIC system running on the 6801 development board. IBM visits CSG, sees the 6801-based system, and wants to “buy” one. Since they can’t sell Volker-Craig’s hardware, CSG quickly decides to build a new 6809-based system to provide to IBM. Local engineer Jerry Krist is recruited to design and build the hardware. CSG and IBM sign a contract for the sale of the 6809-based system. The contract refers to the new machine as the “MICROWAT”. Professor Wes Graham (head of CSG) decides that the MICROWAT might be useful as part of the undergraduate computing infrastructure at the University, and suggests that Waterloo fund and build 32 MICROWATs for use in the CS250 class the following fall. However, concerns about the ability of Krist and CSG to complete the machine in time are growing. Worried that the MICROWAT won’t make the deadline, CSG contracts with local hardware manufacturer BMB CompuScience to produce a PET-based version of the MICROWAT design. CSG proposes to the CS department that a 6809-equipped PET is the only solution that can be guaranteed for the fall. The department forms a committee, and decides that they prefer the MICROWAT despite the risks. The MICROWAT work continues. The VIC-20 is made available for sale in the US, initially priced at $299 (later falling to $99). Commodore offers to loan Waterloo 32 CBM 8032 machines for the fall. These would be equipped with BMB boards make them into SuperPETs. Commodore executives visit CSG. They express interest in building the new hardware, but don’t think they can be in production for 6 to 12 months. CSG concludes that MICROWAT won’t make the CS250 deadline. Work will continue on the MICROWAT, but the SuperPET will be used in the fall. 11. Who developed this truly unique microcomputer system? The hardware implementation of the product was completed by BMB Compuscience and the software was developed by Waterloo Computing Systems, Limited. Both companies are located in Canada. 12. Exactly why was the SuperPET developed? Commodore ships first SuperPET (implied by press release from July, 1982, see below). US pricing is $1695. The 8050 disk drive, effectively required to use the machine, also lists for $1695. IBM shows their new Personal Computer at the same show. Commodore-64 introduced at Winter CES. 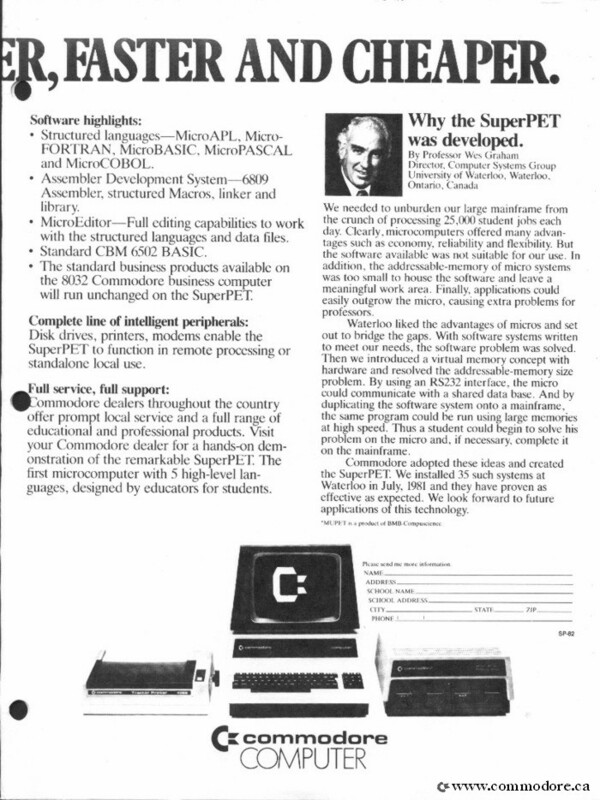 SuperPETs were initially assembled in Canada; production then moved to Santa Clara. After sales hardware and software support for the SuperPET was kept in Canada. Terry Wilkinson, writing in Canadian Datasystems, discusses the genesis of HOSTCM. “Since most large to medium size computers support ASCII-type terminals, the approach involved an RS232-C serial line from the micro to the mainframe. Host communications module (HOSTCM) is the interface program developed for the mainframe to service data management requests from the micro. This approach assisted programs on the microcomputer to access data files on the local disk or on a remote host with equal ease. “SuperPET with disks and printers can support five languages and the editor with any connection to a remote computer. A SuperPET connected to a host computer might have no local devices and keep all its files on the host. It was clear that the combination would yield a powerful micro configuration with the ability to transfer information to and from the host machine. “The IBM 370 and PDP 11 were capable of handling their part in the system. With previous knowledge of its construction, it was felt that the CBM8032 Commodore PET could be modified to do the job. Changes required were the conversion to the Motorola 6809 microprocessor chip, addition of more RAM and an RS232 serial interface. The team wanted to retain the 6502 processor and allow the machine to operate as a normal CBM8032, to preserve the ability to run existing packages for the 6502. Commodore 64 available at retail for $595. More than 2 years after the introduction of the machine, Byte Magazine reviews the CBM 8032.26 They never review the SuperPET. After a disagreement with the Chairman, Irving Gould, about succession and future directions for the company, Jack Tramiel resigns as CEO of Commodore. Commodore’s in-house magazine, Commodore: The Microcomputer Magazine features a full-page SuperPET ad.32 This is the last known Commodore print ad for the SuperPET. Harold Alkema and Kenneth McLaughlin, “PET/SuperPET” entry, Out of the Shadow of Orthodoxy: Waterloo@50 Chronology Glossary, (Waterloo: The University of Waterloo, 2007). “Creative Computing Buyer’s Guide”, Creative Computing, 7/9 (September, 1981). See also Doll, “What Can You Buy for Under $1000”, same issue. Terry Wilkinson, “SuperPET’s Super Software”, COMPUTE! The Journal for Progressive Computing, 3/11 (November, 1981), p. 28-38. TPUG Magazine, (Feb, 1985), p. 22, and Allison Cunliffe, “Computer club rescues Commodore model”, Toronto Star, 4 August 1985, p B5.